Cats are agile, have excellent timing and are mighty quick. Those traits can lead to a first-class door dasher who sprints for freedom the moment he hears the keys in the lock. This is a dangerous habit not only for the cat, but for also the person standing outside with bags in their arms. Fortunately, door dashing is easily rectified with a bit of forethought on your part. Take the time to set up the situation when you aren’t in a hurry or overburdened with bags of groceries. These techniques and your good timing may save your cat’s life one day. The first step is to create an “official” greeting place in the room that is away from the door.Make this new spot a commonly used affection area for interactive play, petting, treats and if she enjoys it, grooming. Whether you are leaving the house or returning home, all hellos and good-byes should take place at the new greeting spot. If your cat is waiting for you at the door when you arrive home calmly call her over to the greeting place and then give her the attention she wants. Try teaching “Greeting Place” as a verbal cue you can use as you enter the door. Many cats dislike water. If this is the case with your cat, use a plant sprayer set on stream to discourage this behavior. Open the door just a crack and give a quick squirt of water. Don’t go inside immediately after squirting her. Wait several minutes so she’ll have time to regain her composure and be ready to greet you. Cats are very smart, if you spray the water and then walk right in, she’ll know it was you. You want the cat to think when the door opens, water sprays in, not when I see my guardian I get wet. Once inside continue to the greeting place and then give your cat attention. Carry the squirt bottle with you or set it by the door. When you come home, get the bottle ready and then carefully open the door just a bit. Regardless if you see the cat or not, use the squirt bottle. While you are still outside, bend down and spray several squirts through your doorway. Say nothing. 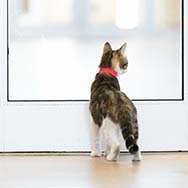 You want your cat to associate the unpleasantness with the door opening, not your presence. If you are caught unprepared, use your keys. Throw them down right in front of you as you open the door (while avoiding hitting your cat). This will startle your cat without harming him. It’s not a perfect tool but it’s one you will almost always have when you come through the door. If he gets through this blockade do not turn and correct him as he runs off – that only teaches him to run away from the house very quickly. If the cat has run out the door, it is too late to teach him not to run out the door. Just chalk the experience up to learning and either open the door more slowly next time. Two or three thwarted attempts should teach them to stay well away from the door when you open it.